Education, Shelter, Food & Clothing: There are several orphans who are abandoned on streets and get habituated to the vices of the society and end-up being criminals, prostitutes or take up begging, unless someone takes care of them and provides an alternative dignified life to fend for themselves. 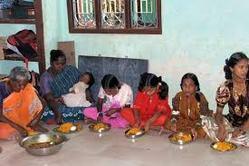 FFIsland of Hope, the orphanage of AID INDIA was established in 2006 in Virudhunagar. 100 children (boys and girls) between 4 and 18 years old live here happily as a family! n orphanage is a children’s care home devoted to the care of orphans—children whose parents are deceased or otherwise unable or unwilling to care for them. Orphanages are one way of providing for their care, housing and education.